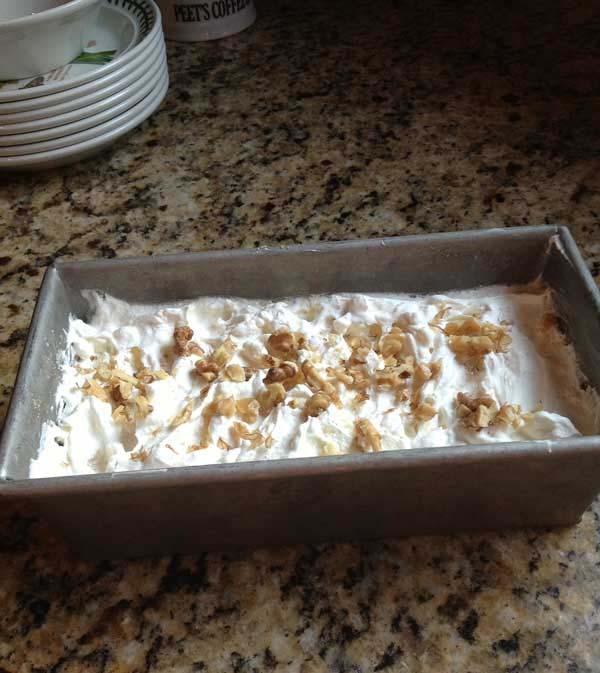 One of the best things my grandmother made was a dessert called banana split cake. It wasn’t really a cake at all, but a layer of cookie crumbs topped with a creamy custard of some sort, whipped cream, pineapple and bananas. Over the years I’ve tried several versions of the recipe trying to get it like my grandmother’s, but most contained cream cheese and just didn’t taste quite right. But now I’ve found the version — or at least perfect in my opinion because it’s the closest to the one Bessie made. Plus it doesn’t call for bananas, which is a huge plus since Todd can’t stand them. 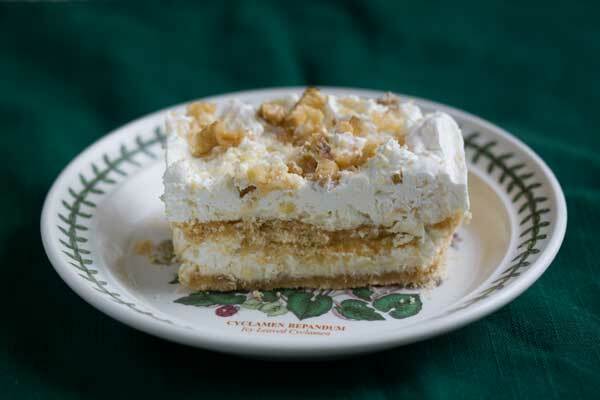 This very simple icebox cake is made with Nilla wafers, eggs, butter, cream and pineapple. It’s best made a full day ahead, and can be made in either a loaf pan, square dish or casserole. I make mine in a loaf pan, but for a crowd I would multiply it times 3 and make it in a 9×13 inch dish (hint: great Memorial Day dessert!). Pineapple dessert made with vanilla wafers, egg, butter and whipped cream. This version is a little different than the others. Rub an 8 1/2 by 4 1/2 inch or 9x5 inch loaf pan generously with butter. Sprinkle half of the crumbs over the bottom of the pan and press down tightly. In a mixing bowl, using a handheld electric mixer, beat the cream until stiff peaks form. Beat in half of the vanilla and 1 tablespoon of the confectioners’ sugar. Fold in the drained pineapple and set aside. In a second mixing bowl, beat the softened butter and remaining 3/4 cup confectioners’ sugar until creamy. Beat in egg and remaining vanilla. Pour half of the egg mixture over the crumbs (you don't have to cover them completely), then carefully spread half of the whipped cream/pineapple mixture over the egg mixture. Make a second layer by sprinkling on remaining crumbs, pouring on remaining egg mixture, and carefully spreading a top layer of whipped cream/pineapple mixture. Chill for about 8 hours or overnight. Before serving, sprinkle top with toasted and crushed walnuts. Cut into squares and serve. This sounds like a recipe my grandmother and mother used to make. I’ve been looking for it everywhere and hopefully this is the same thing. It was always a family favorite on holidays and continues to be with the next generations. I love Banana Split dessert (with the raw egg custard). You could easily leave out the bananas. But, definitely use fresh, sliced strawberries and drizzled chocolate & peanut pieces on top of the homemade whipped cream. I will try this for Memorial Day! I am with Todd, bananas, no thanks! My Mom would like this. I’m glad Todd liked it and I’m glad you’ve found something close to what your Grandma made. Looks good, Martha! They probably taste very similar. I am so glad they have pasteurized raw eggs now because the egg helps add a certain lightness to the filling. Your recipe is similar to what my grandma called Vanilla Wafer Pudding. I found this version when searching for one that didn’t use raw egg. I made it with crushed wafers & it tasted like I remembered from my childhood. Cream butter and sugar. Add pineapple and nuts. Alternate layers of whole vanilla wafers and pineapple mixture in square baking dish (9×9) using 3 layers of pineapple mixture. Whip cream and sweeten with 1 tsp. sugar. Cover entire mixture. Refrigerate overnight. I love creamy desserts like this, especially ones that use whipped cream, rather than its redheaded stepbrother, cool whip. Yes, he loves this one! So, has Todd tried ut yet? I remember a dessert my Mom used to make and I always tried to get her to write it down, but no luck.